Bob Pietrowsky, Director of IWR (right), and Frank Rodríguez, Executive Director of INDRHI (left), sign the memorandum of understanding on behalf of ICIWaRM and CEHICA. Looking on is UNESCO’s Acting Director of the Division of Water Sciences, Alberto Tejada-Guibert (center). 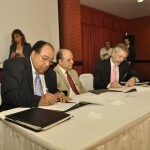 Hidráulicos (INDRHI) of the Dominican Republic signed a Memorandum of Understanding of June 30, 2011 in Juan Dolio, DR. 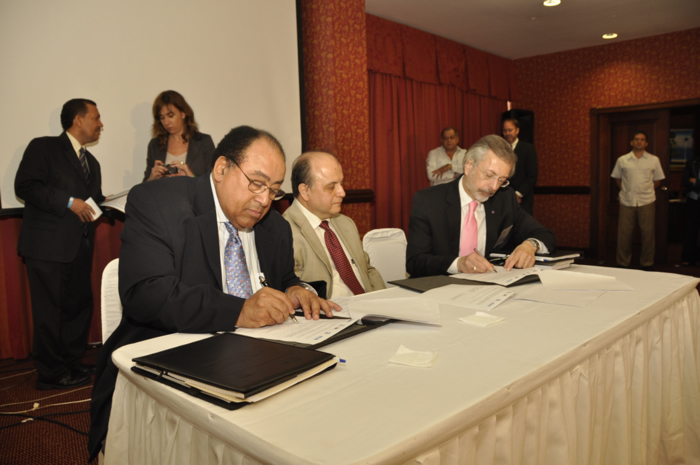 The agreement was signed by Bob Pietrowsky, Director of IWR, and Francisco T. Rodriguez, Executive Director of INDRHI. The primary purpose of the agreement is to facilitate cooperation between the International Center for Integrated Water Resources Management (ICIWaRM), hosted by IWR, and the Centro para la Gestión Sostenible de los Recursos Hídricos en los Estados Insulares del Caribe (CEHICA) (Centre for the Sustainable Management of Water Resources in the Caribbean Island States) , hosted by INDRHI. ICIWaRM and CEHICA are both UNESCO “Category 2” Centers—institutions that are “under the auspices of UNESCO” but are operated by their respective host countries. Both ICIWaRM and CEHICA, and their host institutions, share a common interest in integrated water resources management (IWRM); sustainable development; water management in coastal regions; national and international partnerships; and capacity building through technology, information sharing, education and training. USACE IWR already has somewhat similar agreements in place with UNESCO centers in Chile, Japan, and The Netherlands, and is also collaborating with centers in Brazil, Paraguay, and Poland. The signing ceremony took place at a series of meetings held by the UNESCO International Hydrological Programme’s (IHP) office for Latin America and the Caribbean. Alberto Tejada-Guibert, Acting Director of the Division of Water Sciences and Secretary of IHP, participated in the ceremony. ICIWaRM was an observer or participant at all of the meetings, which included sessions for National Committees for IHP, UNESCO program and project leaders, and UNESCO Category 2 Centers and UNESCO University Chairs. ICIWaRM is the global technical secretariat for one such program, “Water and Development Information for Arid Lands — a Global Network (G-WADI)”.